The next upcoming Chinese New Year is on Saturday January 25th, 2020. 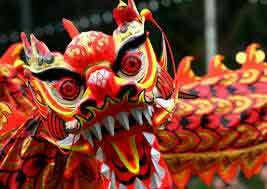 Chinese New Year is the first day of the New Year in the Chinese calendar. It is also known as the Lunar New Year or the Spring Festival. Mostly celebrated by the Chinese communities, Chinese New Year celebrations can last for days. Special activities include lion and dragon dances, parades of costumes, firecrackers, and floats, street fairs, fireworks, and pageants Flowers and signs of good luck in the color red are symbols of the New Year. Chinese New Year in the United States grew in popularity with the growth of Chinese immigrants in the 19th century. Today, the Chinese make up 20% of the almost 12 million Asians in the United States. The Chinese calendar is different from the Gregorian Calendar most of the Western world uses with New Year Day falling on January 1st each year.